Admiral Markets along with JFD Brokers and GMO CLICK Securities introduce changes to their trading terms ahead of Brexit vote. Admiral Markets joins the growing list of brokers who have introduced amendments to their trading conditions to reflect the possibility of market volatility leading up to the referendum. Margin requirements for all GBP currency pairs and FTSE100 index CFD will increase by five times on Admiral.Markets and Admiral.Classic accounts and by two times on Admiral.Prime accounts. The new leverage rates for each respective account are detailed on the company’s website. In addition, internal fund transfers from or to GBP accounts via Trader’s Room may be temporarily disabled on 23 June, starting from 12:00 am until 12:00 pm EET. Opening new positions using exotic currency pairs and the less liquid cross rates with GBP will be restricted for the duration of the above terms. The ‘Close Only’ mode will be enabled for the following instruments: GBP/CAD, GBP/NZD, GBP/CZK, GBP/HKD, GBP/MXN, GBP/PLN, GBP/SGD, GBP/TRY, GBP/ZAR. Two further brokerages have also announced changes to their trading terms ahead of the forthcoming Brexit referendum. 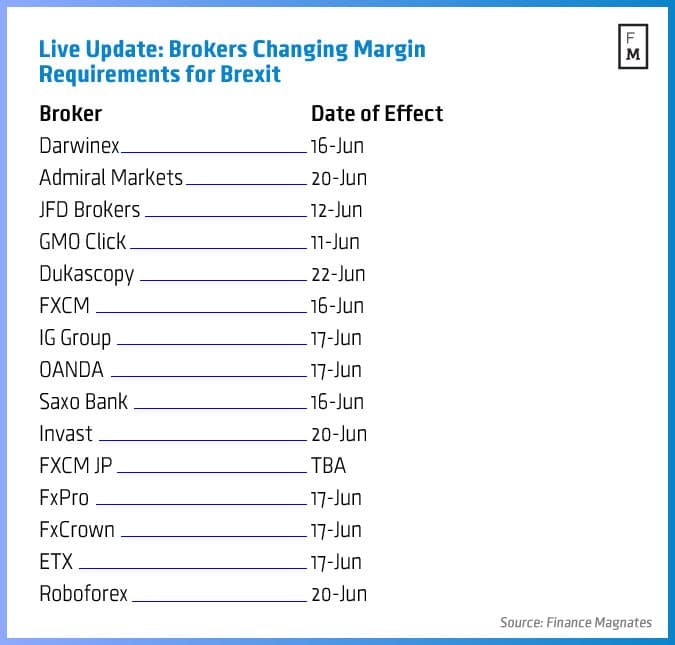 JFD Brokers has also announced updated FX margin requirements for several FX pairs effective at market open on 12 June. This will include a reduction of the margin requirement on several major pairs from 1% to 0.5%.The required margin on AUD/USD, USD/CAD, USD/NZD, USD/JPY will be 0.50%. All other FX pairs except exotics will be 1% and exotic pairs that contain DKK, HKD, TRY, RUB, CNH, MXN, ZAR and ILS will be 2%. Japanese-based GMO CLICK Securities Ltd has said that it will be setting a temporary threshold level on the number of open positions that traders can open from 11 June until 2 July. The company, taking into account the possibility of the financial markets being hit by sharp market fluctuations for GBP related currency pairs, has also provided its clients with a comprehensive chart outlining the changes in its target currency pairs which is available on its website.